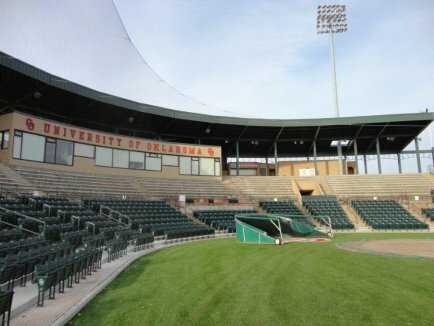 No More Steel Worries: Oklahoma University (Norman, OK), L. Dale Mitchell Baseball Stadium has finished the final stages of its most recent facelift. Construction project has added more box seats and field turf behind homeplate and in foul territory. The additions were added in an effort to allow fans to become more intimate with the play on the diamond, and the new seats raised stadium capacity to nearly 3,000. Burbank Sport Nets installed a giant complete UDR2 Dyneema netting and synthetic cable system. The UDR2 System was a perfect fit for OU. The synthetic backstop cable system provided for a superior alternative to the older style steel cable systems of the past…keeping the OU program on the cutting edge of stadium technology and advancements in the industry. The UDR2 backstop netting is virtually invisible when standing in the 4th row of seats giving the fans a feeling of being right in the game.